Map showing the major Varangian trade routes: the Volga trade route (in red) and the trade route from the Varangians to the Greeks (in purple). Other trade routes of the 8th to the 11th centuries shown in orange. The trade route from the Varangians to the Greeks (Swedish: Vägen från varjagerna till grekerna, Belarusian: Шлях з варагаў у грэкі, translit. Shlyakh' z varahaw u hreki, Ukrainian: Шлях із варягів у греки, translit. Shlyakh iz varyahiv u hreky, Russian: Путь из варяг в греки, translit. Put' iz varjag v greki, Greek: Εμπορική οδός Βαράγγων–Ελλήνων) was a medieval trade route that connected Scandinavia, Kievan Rus' and the Eastern Roman Empire. The route allowed merchants along its length to establish a direct prosperous trade with the Empire, and prompted some of them to settle in the territories of present-day Belarus, Russia and Ukraine. The majority of the route comprised a long-distance waterway, including the Baltic Sea, several rivers flowing into the Baltic Sea, and rivers of the Dnieper river system, with portages on the drainage divides. An alternative route was along the Dniestr river with stops on the Western shore of Black Sea. These more specific sub-routes are sometimes referred to as the Dnieper trade route and Dniestr trade route, respectively. The route began in Scandinavian trading centers such as Birka, Hedeby, and Gotland, crossed the Baltic Sea, entered the Gulf of Finland, and followed the Neva River into Lake Ladoga. Then it followed the Volkhov River upstream past the towns of Staraya Ladoga and Velikiy Novgorod, crossed Lake Ilmen, and continued up the Lovat River, the Kunya River and possibly the Seryozha River [ru]. From there, a portage led to the Toropa River [ru] and downstream to the Western Dvina River. From the Western Dvina, the ships went upstream along the Kasplya River and were portaged again to the Katyn River, a tributary of the Dnieper. Along the Dnieper, the route crossed several major rapids and passed through Kiev. After entering the Black Sea, it followed its west coast to Constantinople. The route from the Varangians to the Greeks was first mentioned in the Primary Chronicle, but its effects were reported much earlier, in the early ninth century when the Byzantines noted newcomers in their regions, the Varangians. 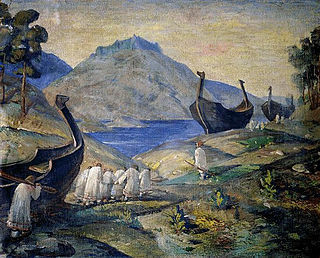 Though this has come to mean "Vikings" to many, the term for the Byzantines meant all Scandinavians and their kindred living in what is now Russia. The route was probably established in the late 8th and early 9th centuries, when Varangian explorers searched for plunder but also for slaves and lucrative goods. The route gained significant importance from the 10th until the first third of the 11th century, concurrently with the Volga trade route and the trade route from the Khazars to the Germans. According to Constantine VII, the Krivichs and other tribes dependent on Kiev transported hollowed-out sailboats, or monoxyla, which could accommodate thirty to forty people, to places along the rivers. These sailboats were then transported along the Dnieper to Kiev. There they were sold to the Varangians who re-equipped them and loaded them with merchandise. Places named include Smolensk (Μιλινισκα), Liubech (Τελιουτζα), Chernihiv (Τζερνιγωγα), Vyshhorod (Βουσεγραδε), Vytachiv (Vitichev, Βιτετζεβη), and Kiev (Κια[ο]βα). Some of these cities had alternate names in Old Norse, and Constantine quotes some of them: So Novgorod (Νεμογαρδα) is the same as Hólmgarðr (‘Island Enclosure’) and Nýgarðr (‘New Enclosure’); Kiev is equally called Kœnugarðr (‘Boatyard’) or Σαμβατας, which might derive from Norse Sandbakki-áss (‘Sandbank Ridge’). Though Constantine Zuckerman suggests a more obvious etymology, from the Turkic (Khazar) roots sam and bat (literally, ‘upper fortress’). The runestone N 62 preserves the name Vitaholmr (‘demarcation islet’) for Vytachiv. On the Dnieper, the Varangians had to portage their ships around seven rapids, where they had to be on guard from Pecheneg nomads. The rapids began below Dnipro where the river turns south and fell 50 meters in 66 kilometers. They don't exist anymore, as a chain of basins was established starting from the 1950s to the 1970s. Below the rapids, they had to pass a narrow rocky spot called the Ford of Vrar (Russian: Krariyskaya crossing), where the Varangians were often attacked by the Pechenegs. The Varangians stopped at St. George Island. Then they equipped their ships with sails in the Dnieper estuary and continued to navigate along the western shore of the Black Sea all the way to Constantinople (Slavic: Tsargrad, Old Norse: Miklagarðr). The Trade Route from the Varangians to the Greeks was connected to other waterways of Eastern Europe, such as the Pripyat-Bug waterway leading to Western Europe, and the Volga trade route, which went down the Volga waterway to the Caspian Sea. Another offshoot was along the Dnieper and the Usyazh-Buk River towards Lukoml and Polotsk. The Trade Route from the Varangians to the Greeks was used to transport different kinds of merchandise. Wine, spices, jewelry, glass, expensive fabrics, icons, and books came from the Byzantine Empire. Volhyn traded spinning wheels and other items. Certain kinds of weapons and handicrafts came from Scandinavia. 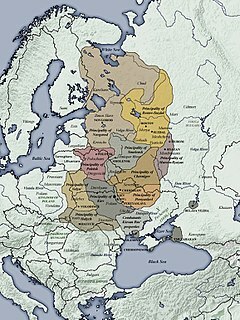 Northern Rus' offered timber, fur, honey, and wax, while the Baltic tribes traded amber. In the second half of the eleventh century, the Crusades opened more lucrative routes from Europe to the Orient through the Crusader states of the Middle East. By that time, Rus' had strengthened its commercial ties with Western Europe, and the route from the Varangians to the Greeks gradually lost its significance. For a related military route, see Muravsky Trail. A large part of the best-selling Swedish historical novel The Long Ships (original Swedish Röde Orm) by Frans Gunnar Bengtsson describes the adventures of a Danish ship crew (with a pilot from Gotland) taking this route in the late 10th Century. Rosemary Sutcliff's 1976 novel Blood Feud takes place during the 10th-century, and depicts a half-Saxon orphan who joins a Viking crew and takes this route, joining the Varangian Guards and ultimately settling in Constantinople. The second book of Henry Treece's Viking Trilogy, The Road to Miklagard, published in the late 1950s describes a Viking voyage through the Mediterranean to Constantinople, where the main characters are taken as slaves and later become members of the Varangian Guards. They eventually make their way back to their home village via the trade route. 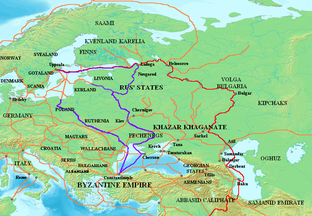 In Stephen R. Lawhead's novel Byzantium, the main character, a 9th-century Irish monk, is taken by Viking raiders from Scandia to Constantinople via this route. In the comic strip Prince Valiant, pages 932 (19 Dec 1954) to 988 (15 Jan 1956), the eponymous main character and company travel on two Viking longships from Constantinople to Scandia via this route, during which they encounter Patzinaks and Polotjans. Two music albums coincidentally released in 2007 deal with fictional journeys down the trade route, heavy metal band Rebellion's Miklagard — The History of the Vikings Volume 2 and folk metal band Turisas' The Varangian Way. Michael Crichton's fictional work Eaters of the Dead uses the framework of this trade route, in the book's first portion, to explicate a journey from the Middle East all the way to Scandinavia. This book was the basis for the film The 13th Warrior. ^ An English translation of De Administrando Imperio. ^ ActiveSoft, Developed by. "Basarabi - complexul de biserici rupestre". www.crestinortodox.ro. Jordan, Robert Paul (March 1985). "When The Rus Invaded Russia... Viking Trail East". National Geographic. Vol. 167 no. 3. pp. 278–317. ISSN 0027-9358. OCLC 643483454. Thomas Schaub Noonan (1965). The Dnieper Trade Route in Keivan Russia (900-1240 A.D.). 1. Thomas Schaub Noonan (1967). The Dnieper Trade Route in Kievan Russia (900-1240 A.D.). 2. University Microfilms. Dixon, D.F., 1998. Varangian-Rus warrior-merchants and the origin of the Russian state. Journal of Macromarketing, 18(1), pp.50-61. Adelson, H.L., 1960. Early medieval trade routes. The American Historical Review, 65(2), pp.271-287. Sverdlov, M.B., 1970. Transit Routes in Eastern Europe in the 9th to 11th Centuries. Soviet Geography, 11(6), pp.472-479. Petrukhin, V.J., 2006. The Dnieper rapids in" De administrando imperio": the trade route and its sacrificial rites. BAR INTERNATIONAL SERIES, 1499, p.187. The Dnieper is one of the major rivers of Europe, rising in the Valdai Hills near Smolensk, Russia, and flowing through Russia, Belarus and Ukraine to the Black Sea. It is the longest river of Ukraine and Belarus and the fourth-longest river in Europe. The total length is approximately 2,200 km (1,400 mi) with a drainage basin of 504,000 square kilometres (195,000 sq mi). The river is noted for its dams and hydroelectric stations. The Dnieper is an important navigable waterway for the economy of Ukraine and is connected via the Dnieper–Bug Canal to other waterways in Europe. The Berezan' Runestone was discovered in 1905 by Ernst von Stern, professor at Odessa, on Berezan' Island where the Dnieper River meets the Black Sea. The runestone is 48 cm (19 in) wide, 47 cm (19 in) high and 12 cm (4.7 in) thick, and kept in the museum of Odessa. It was made by a Varangian (Viking) trader named Grani in memory of his business partner Karl. They were probably from Gotland, Sweden. Blood Feud is a historical novel for children written by Rosemary Sutcliff and published in 1976.